For a business to run efficiently it needs to be organized and it needs to utilize visual cues. 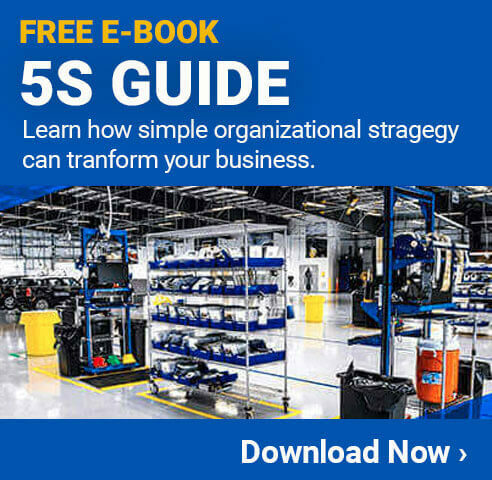 5S is a basic Lean tool, and it's often one of the first tools businesses new to Lean choose to implement. This is because 5S helps maintain the workplace in a clean, logical state where people know what they need to do and can quickly see when something is out of place. These five S's are a method for assessing, organizing, and maintaining the workplace in the best condition possible. During the Sort phase of 5S, people go through all contents of an area and determine what is needed and what isn't. Anything not needed in the workplace should be removed. Items of uncertain value are often tagged with red tags and set aside so others can assess them or so they can be revisited at a later date to decide if they're needed. Second, items that are needed are Set in Order in a logical fashion. This means placing items used most frequently closest to employees, placing items in the order in which they're used, and placing items so people can reach them without making any unergonomic movements. Next, a plan is set up for cleaning and performing maintenance in the workplace. This is called the Shine phase. During this phase people might mop floors, clean machinery, service equipment, etc. Shine should be performed regularly, often daily. Standardize refers to putting procedures in place for performing 5S. This could include schedules, diagrams, checklists, and training programs. This way 5S practices are clear and available for people to reference. Finally, the last part of 5S is Sustain, which means maintaining the 5S program so it doesn't fall by the wayside. This often involves teaching employees to make 5S a routine and have a 5S mindset, which means making the steps of 5S a part of regular work tasks. In addition to organizing the workplace and keeping it clean, 5S also implements visual cues in a facility such as signs, labels, floor markings, color-coding, and other methods of communicating visually. These tools help people navigate the workspace and follow instructions without needing to ask unnecessary questions. A workplace that uses visual cues to ensure processes happen smoothly and people understand spaces is called a visual workplace.